Wales fly-half Dan Biggar will be targeted by France when the teams meet in the Six Nations on 26 February, says assistant coach Neil Jenkins. The warning comes after Johnny Sexton took a number of heavy tackles in France's 10-9 win over Ireland. Sexton was eventually forced off, and France lock Yoann Maestri was warned by the citing commissioner. "I think these boys have to realise they're in the firing line in today's game," said Jenkins. "There's no hiding place and he's just got to get on with it and front up." Sexton was under fire throughout the the game, with one television replay clearly showing Maestri striking the Leinster fly-half in an off-the-ball incident. Biggar was himself forced off in Wales' 16-16 draw with Ireland in Dublin, but his injury was the result of turning on his ankle. He played most of the 27-23 win over Scotland, but had his foot strapped after being replaced in the 76th minute. 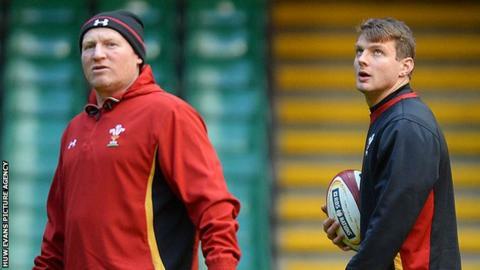 "He (Biggar) is tough, so let's just hope he keeps going and doing what he has been doing," Jenkins told BBC Radio Wales. "We need him to keep playing as well as he has. If sides target him, that is a positive for us, because it shows how well he has been playing. "We can't hide him. Wherever he plays, unless we get him a seat near the posts, he will be targeted, (as) he was against Ireland and Scotland. "If they want to target him, he is good enough and strong enough to deal with that and he should take it as a compliment." Jenkins also says Biggar's Ospreys half-back partner Rhys Webb needs more game-time before he is considered for a Wales recall. Webb made his Ospreys comeback against Munster last Sunday after being out since September with a foot injury. But the scrum-half suffered a knock to the head which looks set to rule him out of the region's match against Edinburgh on Friday.